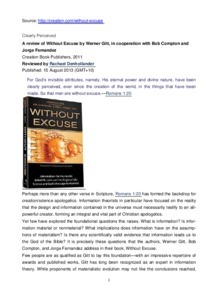 A review of "Without Excuse"
Perhaps more than any other verse in Scripture, Romans 1:20 has formed the backdrop for creation/science apologetics. Information theorists in particular have focused on the reality that the design and information contained in the universe must necessarily testify to an all-powerful creator, forming an integral and vital part of Christian apologetics. Yet few have explored the foundational questions this raises. What isinformation? Is information material or nonmaterial? What implications does information have on the assumptions of materialism? Is there any scientifically valid evidence that information leads us to the God of the Bible? It is precisely these questions that the authors, Werner Gitt, Bob Compton, and Jorge Fernandez address in their book, Without Excuse. Few people are as qualified as Gitt to lay this foundation—with an impressive repertoire of awards and published works, Gitt has long been recognized as an expert in information theory. While proponents of materialistic evolution may not like the conclusions reached, the work cannot be lightly dismissed. Without Excuse relies upon undisputed laws of science and logic, drawing from a wide range of mainline, peer-reviewed scientific publications in formulating the premises of the book as well as in representing the claims of today’s prevalent scientific materialism. While this work is significant to experts, it is also important for any Christian desiring to better understand the claims of materialistic evolution and be capable of following the biblical command to “tear down strongholds and every lofty thing raised up against the knowledge of God.” Relevant to both the information theorist and the average person, Without Excuse contains essential information for understanding and engaging the culture. Premised on the truth of Romans 1:20, the authors decisively confront the issue of defining information and its properties, and proceed to formulate a scientifically valid series of deductions demonstrating how the existence of information leads one first to the existence of a ‘god’, and then specifically to the God of the Bible. A critical component of the book is in the Introduction, where the authors bring the debate into the realm where it properly belongs: that of religion. The authors note that this “ancient war” between creationists and evolutionists is ultimately one of competing worldviews, wisely refusing to give ground where it matters the most: defining the conflict, thereby establishing a critical framework for the remainder of the book. Chapter one focuses on the immense level of detail and organized complexity in the physical world. Gitt’s presentation of a variety of natural marvels captures the imagination and instils a sense of wonder in readers of all ages and backgrounds, providing a springboard for the next seven chapters. Chapters two through five delve deeply into fundamental questions of information theory. Gitt begins by exploring the definition and characteristics of information and explaining why previous theories fall short. He proposes three necessary conditions for, and five levels of, information, followed by 23 empirical statements which define the characteristics and effects of what he has called “Universal Information”. Throughout, Gitt discusses the necessary effect the existence of information has on one’s perception of reality, as well as the impact it has on both materialism and a Christian apologetic. While chapter two does signal a shift into technical work, the material is made accessible through the use of graphics, diagrams, and real-life examples of the concepts. Chapters four through five lay the final pieces of groundwork through a discussion of the characteristics and limitations of science and then apply these principles to information theory to formulate laws of science which govern the realm of Universal Information. The importance of understanding this foundation cannot be overstated—indeed, the common misunderstanding of ‘science’” is arguably the center of the controversy, and until Christians gain a proper understanding it will be difficult, if not impossible, to make significant progress. The authors’ continued emphasis on the foundational issues at play makes Without Excuse unique in its approach, as well as vitally important for readers in all walks of life. The Rosetta Stone (kept in the British Museum in London) gave the key to deciphering hitherto unknown coded sequences. But even before that, no-one disputed that the information in such sequences was the consequence of intelligence. Without Excuse shows that the type of information in biological codes fits the same criteria. Chapter eight begins the application of information theory to a Christian apologetic. The authors demonstrate eight “far-reaching deductions” that flow from Universal Information, including the existence of an intelligent sender, and that sender’s characteristics. This leads to the conclusion that there must be some sort of deity as the creator of life. Each truth statement is supported by the laws of science and logic and arrived at by careful deductive reasoning, making the case for a creator with academic precision. Gitt’s work culminates in chapter nine, where he demonstrates that this creator must be the God of the Bible, providing a compelling argument that the God of the Bible is, and must be, the source of life, making the claims of Scripture true for all humanity. Taken as a whole, the most appreciated and essential feature of Without Excuse is the interweaving of solid academic material with worldview analysis, providing a work that addresses the foundational aspects of the culture war and vital tools for engaging it. The layout of the book is technical in nature, and some readers may require adjustment to the style, but will ultimately find this format helpful in navigating the material and grasping key concepts. Some readers may also find it helpful to first read the Introduction and chapter one, then chapters six through nine, to gain a better framework for the relevance and direction of the heavier concepts in chapters two through five. On the other side of the spectrum, readers desiring more in-depth discussions will find the appendices helpful and engaging. Without Excuse is an excellent tool for every Christian, providing insight into the clash of worldviews and tools for defending the claims of Scripture. Moreover, it is highly recommended for any individual willing to genuinely investigate the claims of Christianity—they truly will find themselves “without excuse”.